I recorded an album at Abbey Rd Studios!! I'm a member of Glee Club Uk - community choir ( think Military Wives ) and 230 of us went along on Sunday 7th Feb 2016 to record a Christmas album for 2016, just because we could! We'd been rehearsing for several months and it was finaly time. The original plan was that I was going as a passenger in someone else's car along with a couple of others. We were going to drive to the O2 - ( 1hr or so from home in SE London) park there and get the Tube to Abbey Wood (half hr by underground train to NW London) however middle of last week the Tube staff announced a strike for the weekend ! Getting buses from the O2 wasn't practical ( 4 changes of bus and over 1 1/2hrs assuming we could actually get ON the buses as they would be extra busy) so, major rethink required. In the end the strike was called off but we carried on with our newest plans. The original driver had already said she didn't want to drive across London so I hatched a plan. Mike would drive us in our car,- myself in front of car and the other 3 in the back, right to a car park close to the studios that I managed to find. £20 to park for the day - not too bad for London prices. Luckily it was a dry, cold, sunny but windy day in the gap between two major storms. We left home at 7.15am to go and collect the others. Mike knew he wouldn't be allowed in, so he left us at the studios and went off to walk round the nearby Regents Park for the day. 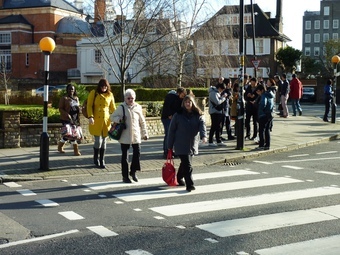 We took some quick photos on the crossing made famous by the Beatles - risking life and limb in the traffic,( one photo downloaded from the Abbey Rd webcam) signed the walls and then went into the studios. The corridors are lined with signed photos, posters etc of all the famous people who have recorded there but we were told not to take photos except in our studios. There we too many staff around to risk sneaky ones.... there are no tours or anything like that so the only way you can get into the building is to be doing a recording. Went downstairs to the cafe with its courtyard garden complete with Abbey Rd street sign on the wall and had a quick coffee and a bacon sandwich, left our coats etc in Studio 2 ( that the Beatles used) few quick pics in there where we went upstairs and snuck into the control room and saw the mixing desk, then into Studio 1 for the recording. 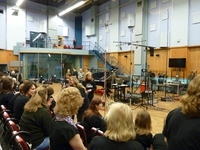 The choir had been split into 2 parts of 115 people each with one lot doing the first session (us) and the others recording after us in the later afternoon and then the two recordings will be merged together. 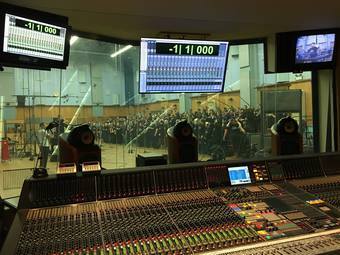 Studio 1 is the biggest purpose built recording studio in the world, usually used for orchestras and film scores. We had one eared headphones so we could hear our music and still hear ourselves singing and microphones everywhere costing we were told over £60,000 set up to catch every sound we made. We had two Abbey Rd sound engineers in a big glass fronted control room at one end which we weren't allowed into running the 72 channel mixing desk. There was a mic RIGHT over my head (gulp ! ) I've read the biographies of the two engineers - all those famous people, huge musical events and then recording us! We also had a video crew filming us, so no pressure !! Anyway, we had 7 songs to do in 2 1/2 hrs. Our Glee Club leader / arranger / conductor Richard wanted it to be perfect so we had to re-record various sections until he was happy with it all. Standing and singing pretty much non stop the whole time was surprisingly tiring! It was over all too quickly then back to Studio 2 to get our stuff out before the 2nd group could start. We went next door into the official shop to buy a few stupidly expensive souvenirs, had to be done - it was so busy with all of us we had to queue for an hour to pay! Short walk back to the car park to meet Mike then the drive home through central London. Made a bit more "interesting" when the sat nav decided to stop working ! Back home at 6.30pm. 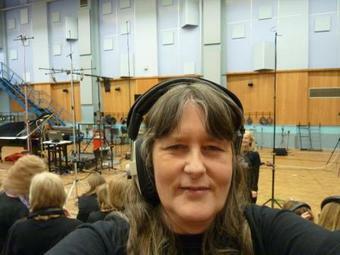 Anyway, not many "ordinary" people, especially us non musicians can say "I made an album at Abbey Rd! " Certainly a day to remember! 1st - 3rd May 2009 What a weekend ! !